Mr. Guenter Reinke (left), CEO of Boehringer-Ingelheim Korea, marks his 60th birthday in Seoul on April 24, 2011. Mr. Guenter Reinke, CEO of Boehringer-Ingelheim Korea, stands apart from many other top foreign executives working and living in South Korea. The 60-year-old German chief executive officer has spent the last 14 years in Korea, working for the Germany-based global pharmaceutical giant. 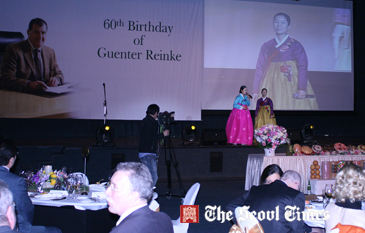 On April 24, 2011 Mr. Reinke celebrated his 60th birthday at the Hyatt Hotel in downtown Seoul with a number of local and international friends. 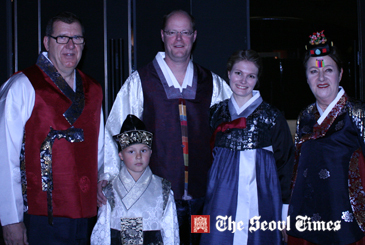 The gala birthday party proceeded in the traditional Korean way with Mr. Reinke and his family members clad from head to toe in traditional Korean robe of hanbok. Kicking off at 5:30 p.m., the party lasted late into the evening. Mr. Reinke used the occasion to express his appreciation for Korea, the country he has called home for over a decade. In his name, a contribution of 11,000 US dollars was donated for the “Healthy Body Healthy Mind” program, which helps local children suffering from various diseases. Leading up to his party, the esteemed CEO had made an earnest request to the invited guests to donate funds for the needy people instead of to bring birthday gifts to him. 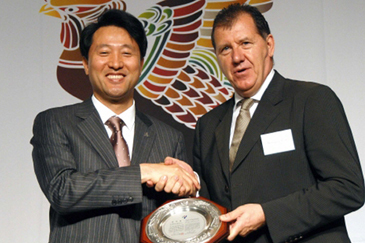 Mr. Reinke’s contributions to Korean society date back more than 10 years ago. Since arriving in 1997, he has been an avid fan of Korea’s traditional culture, particularly in its intangible cultural assets. On Sept. 18, 2010, Mr. Reinke invited all members of his company to celebrate Boehringer-Ingelheim’s 125th anniversary at Banpo District’s Hangang Park by the Han River in Seoul. Among other activities, guests were invited to participate in a kite-flying event, which featured Mr. Reinke's own entry. For the competition the German CEO made a beautiful bamboo-kite with his own hands. Mr. Guenter Reinke (left), CEO of Boehringer-Ingelheim Korea, poses with his family at his 60th birday party in Seoul. Mr. Reinke's love for Korean traditional kite does not stop here. The hanging centrepiece in Mr. Reinke's office is a grand, beautifully-coloured kite, and he keeps these aesthetic cultural assets to give out as presents when special guests visit. “Traditional Korean kites display beautiful colours and delicate lines, and they are especially gorgeous when in harmony with nature while up in the sky,” Mr. Guenter Reinke said in a previous interview with local media. 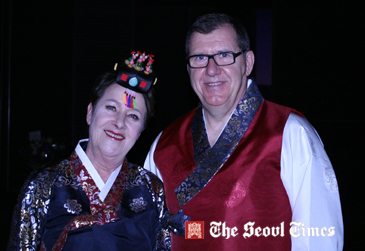 Mr. Reinke dedicates much of his time to social and cultural events in Korea. For years, he has been instrumental in developing a medical award to honour the local medical people who help make enhancements in the medical research area. 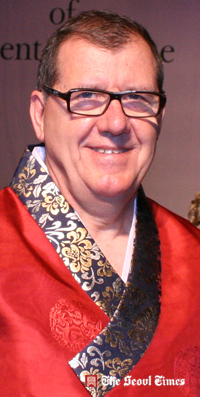 Mr. Reinke’s benevolent contributions to the local Korean society were recognized by the Seoul Metropolitan Government in 2009. Seoul Mayor Oh Se-Hoon awarded him “Seoul Honorary Citizenship” for his love and care of Korea and its people. Friends say Mr. Reinke always calls Korea his second home. After Mr. Reinke became an honorary Seoul citizen, his colleagues and staff at Boehringer-Ingelheim Korea made a Koran nickname for him “Raingang (라인강: 羅仁江),” meaning “benevolent and vast flowing river”in Chinese characters. Mr. Guenter Reinke (right), CEO of Boehringer-Ingelheim Korea, gets his Seoul Honorary Citizenship from Mayor Oh Se-Hoon. Once, Mr. Reinke expressed his satisfaction with his name. “Raingang” in Korean pronunciation means Rhine River. Despite his love of local Korean culture and its people, the German CEO did not fail to admonish Koreans about its culture. 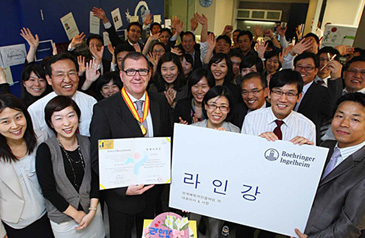 Mr. Guenter Reinke (left), CEO of Boehringer-Ingelheim Korea, is being congratulated by his employees in Seoul. 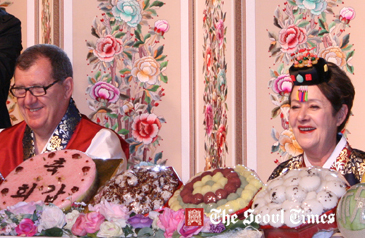 He pointed out that Korean traditions are not as perfectly preserved as Europeans. As for his personal hobbies, soccer comes as his primary activity. His passion for soccer is as great as his love for Korea or even greater, and it started at his young age. At the age of 18, he was recruited by the German professional team, but was seriously injured before signing the contract and was not able to recover fully to play at previous level. Mr. Guenter Reinke (3rd from right), CEO of Boehringer-Ingelheim Korea, poses with his guests at his 60th birthday party in Seoul. He had to give up his plan to become professional soccer player. But while at college he still played for a second-league team. There and then he met South Korea’s soccer legend — Cha Bum-Kun, shortly known as “Tscha (Cha) Bum” in Germany. Cha was the third-highest-paid soccer player in Germany during 1980s. During his Bundesliga career in Germany Cha played in 308 games and scored 98 goals (none from penalty kicks), the highest record for a foreign player at the time. He and Cha maintained their relationship and developed to become valuable friends to each other. They often meet to socialize. 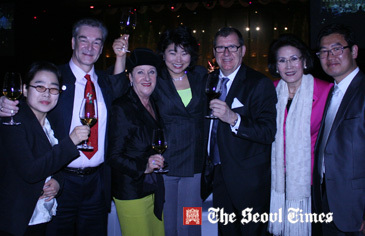 60th birthday party of Mr. Guenter Reinke, CEO of Boehringer-Ingelheim Korea, goes on in Seoul on April 24, 2011. As a enthusiastic fan of soccer he flew to Germany and South Africa to watch live games of 2006 and 2010 World Cup. Even in Korea Mr. Reinke still enjoys playing soccer with his colleagues of his company. He also drinks a traditional rice wine of makgeoli with them after work. “By playing soccer and drinking Korean traditional wine with fellows at my company,” the German CEO was quoted as saying “I was able to break the barriers between workers and myself"
Mr. Guenter Reinke was born in Germany on April 24, 1951. He is married to Mrs. Marlis Reinke. They have one child.